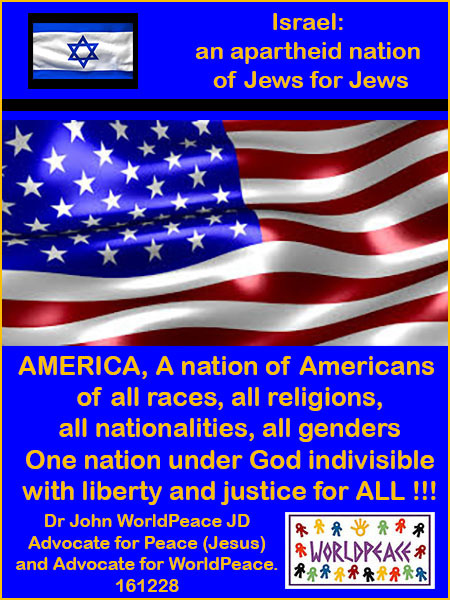 WORLDPEACE – ISRAEL – ADOLPH HITLER: In the 1930’s Adolph Hitler announced his 1000 year Reich and then claimed other countries as part of that Reich as the accessorial home of the Arian Race. He attacked and then annexed those countries. He then went inside those countries, rounded up the Jews and took them off to the Eastern Front and exterminated them. In the 1967 war, Israel took possession of land allocated for the Palestinians, went on a campaign of terror to displace the Palestinians who ended up in refugee camps that still exist today. Against international law the Zionist began to build settlements on the Palestinian lands, demolish Palestinians houses, relocate Palestinians. Same as the Adolph Hitler Nazi plan. Now the United Nations 50 years later has gotten tough with Israel and declared the settlements are illegal and indirectly its intention to in the future move the Zionists from the Palestinian Territory by force if necessary. Prime Minister Netanyahu, a rogue head of state, under the auspices of doing God’s will intends to annex all the territory of the ancient Israel. No different from Adolph Hitler and his claim to ancient territory of the Germans. Netanyahu undeniably has the same mental illness as Adolph Hitler. He is obsessed with restoring Israel to the ancient lands, create a nation of Jews for Jews, and purge the land of Palestinians and set up a theocracy like that in Iran. Now all this would be laughable and tragic but sadly the United States armed Israel with 132+ nuclear warheads. And now we have a head of a postage stamp nation with a mentally unstable Netanyahu as its leader and we all have to wonder about those nuclear warheads. Netanyahu does not acknowledge that the belligerence of the Jews against the Romans in 70 AD is the reason for the diaspora and the end of the state of Israel and the razing of the second Solomon’s Temple. Only a mentally unstable arrogant religious fanatic like Netanyahu would have the guts to take on the whole world. The only reason we are seeing this insanity is because of those nuclear warheads. Netanyahu is ready to set the world on fire in a repeat of the Jewish mass suicide at Masada as opposed to surrendering to the Romans. And even more sadly the USA is about to inaugurate and equally egotistical individual who has proven he is willing to take on the world and even start a new nuclear arms race. Any alliance between Trump and Netanyahu probably means a high probability of another world war started by the Zionist. WORLDPEACE – ISRAEL – USA: Since Mr Netanyahu has seen fit to spit in the face of President Obama it seems that we need to open up the full conversation about Zionism and the future of Israel with Mr. Netanyahu. First, we have to acknowledge that Zionists do not believe in Jesus as savior, nor the resurrection, and quite frankly believe that Christians are delusional on this issue. Second, the Book of Revelation which the Fundamentalist Christians believe, states that in the end Jesus will come and establish Christianity in Jerusalem as the center of the world. So all this conversation of who gets to reside in Jerusalem in the meantime is irrelevant. The Zionist claim Jerusalem as theirs by ancestral claims but the Christians claim that Jerusalem has been reserved for the Christians in the future by Jesus. So the question is why is a Democratic America supporting a non Christian, undemocratic, neo fascist, apartheid state like Israel at all. It would seem that the United States would be better served by achieving statehood for the Palestinians and then building all the military bases it wants in that state. Again, Mr. Netanyahu has stated that he is not going to abide by any ruling of the United Nations so we need to look really deep into the core issues that have prevented peace in Palestine since the end of WWII. At this point, dealing with an ungrateful Netanyahu who refuses to acknowledge that without Harry Truman there would be no Israel, we need to fully open the Israel discussion with no holds barred. We need to discuss the foundational controlling issue of Jesus Christ in this conversation. 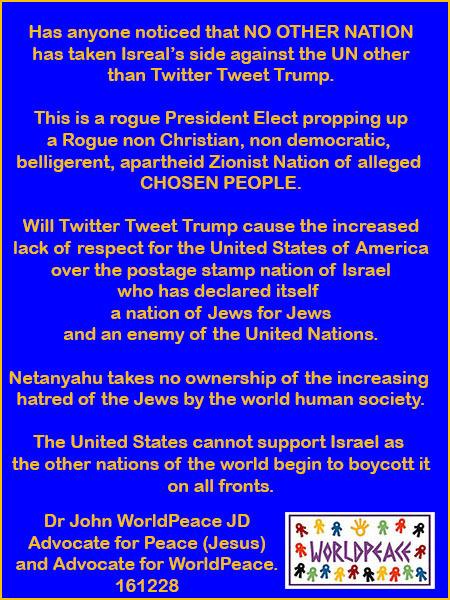 WORLDPEACE – ISRAEL – NETANYAHU – TRUMP: The deadlock has been broken with Israel’s control of the Palestinians. It is just a matter of time that the anti-Jewish pushback is going to explode in the face of Netanyahu and Trump. The UN does not need to pass a resolution to begin to boycott Israeli goods. Each country can do that on its own. If Netanyahu wants to cut diplomatic ties then the cut can be mutual and other countries can start to remove their diplomats from Israel. Israel has no oil. It can easily be choked off. What is going to happen here is that Netanyahu is going to prove that over the last 50 years Israel has never had any intention of working out a peace plan that does not end with Israel taking over as much of the Palestinian Territories as it wants. Netanyahu is going to say it out loud that God has deemed that the Zionist are his Chosen People and they can do anything they want to the Palestinians. The Europeans will block the Zionist and they will go head to head with the United States to do justice for the Palestinians. Trump discounting the United Nations that has prevented a new world war for 70 years is simply crazy. The world is not going to abandon the UN even if Trump tries to move the US against the United Nations. 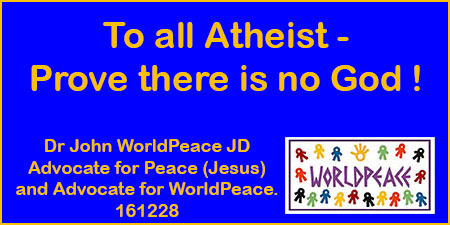 There is no other hope for WorldPeace but the UN. Europe does not want another world war. Russia does not want a world war and neither does China. If Israel wants to continue it course of belligerence, then it will get push back from all the nations of the world. If Trump wants to abandon the United Nations, then the costs will be great. Hard to imagine a boycott of US goods but it can happen. 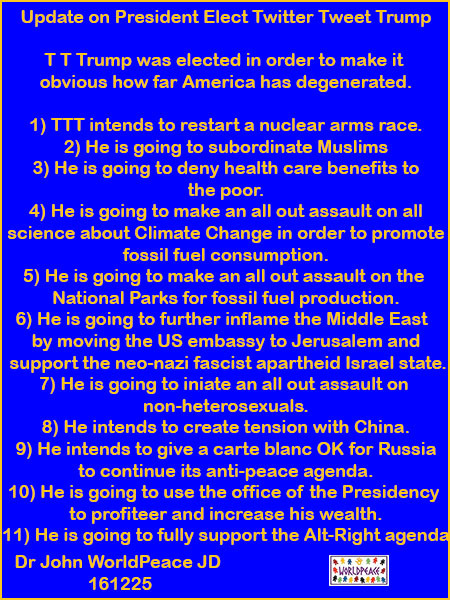 At the max Trump has 8 years to do his dirty deeds and bring chaos to the world. But in the end, the UN will survive, and the rest of the world will survive, and China’s power will soar as the US becomes marginalized. The world knows that Trump did not win the majority of the popular vote. And the world knows all they have to do is wait to undo whatever Trump does to take the world into chaos and maybe a war. And also what is interesting is that if the American public is against a new arms race, the companies that build these weapons may well just decline to bid on the contracts. Hitler was crazy but a smart realist. Trump is just crazy. WORLDPEACE – ISRAEL NETANYAHU: After the rebuke of Israel on Friday Netanyahu is in chaos mode. His arrogance that he could push Obama in a corner time and again, the most serious being the Iran nuclear non proliferation deal, without pushback came crashing down on him Friday when the U S failed to veto the UN rebuke as has been the policy of the US for five decades. No one worked harder than President Obama and John Kerry to work out a Israeli/Palestinian deal. All efforts thwarted with Netanyahu roadblocks. Netanyahu has contempt for all Americans. His “Chosen People” arrogance has no bounds. He still thinks the denial of the Jews to acknowledge Jesus as the world savior is not going to resurface and bite him in the back of the neck. 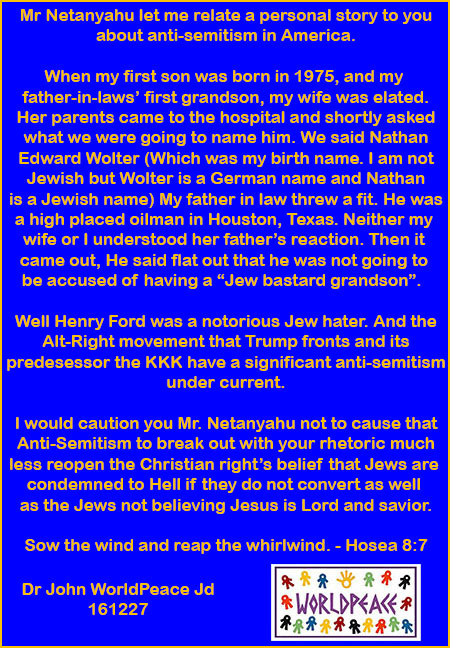 He is a fool because the unspoken foundation of the Alt-Right, Neo-Nazism, the KKK which permeates the world of Donald Trump is at its core Anti-Semitic. Mr Netanyahu is not an American and he does not understand how strong that undercurrent is. The Muslims are drawing attention away from this issue for now. But have no doubt Anti-Semitism is alive in well in the US. And that dragon can be unleashed by missteps by Mr. Netanyahu. The Zionists are every bit the extremist that the Iranians are. Iran has an established Theocracy and Israel wants the same. The right wing of both Iran and Israel are a huge threat to WorldPeace. Especially since Israel has over 132 nuclear warheads provided by the USA. 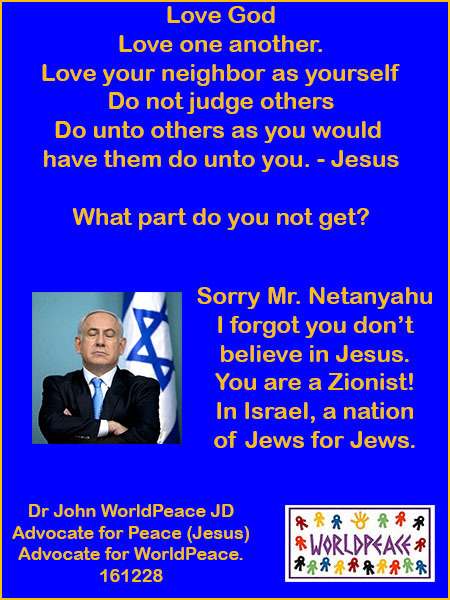 Mr. Netanyahu absolutely believes he represents Gods Chosen People. Yet he is blinded to the reality on the ground. In 671, God gave the Temple Mount to the sons of Ismael and not to the sons of Isaac. There is a global anti-Semitic mindset that has been bolstered by the Zionist pursuing Neo-Nazi apartheid policies against the Palestinians since the end of WWII. And now Netanyahu is going to puff himself up with the Chosen People dialogue and over extend himself to the detriment of Israel. As he says, he UN is not having any of the Zionist Apartheid state. The UN has an extremely slow burn for the sake of WorldPeace. But the UN has spoken and Netanyahu would be well advised to think about what that means. The UN can place sanctions on Israel. The tail of the dog Israel is not going to wag the dog the USA. Once Netanyahu pushes over the edge with Americans, sows the wind if you will, he will definitely reap the whirlwind. Iran just bought 80 commercial jets from Boeing. Iran will become a much bigger trading partner than Israel will ever dream to be. Money is god in secular politics. And Israel has no oil money. Be careful Mr Natanyahu. You misjudged Obama and you are misjudging Americans. Very big, nation killing, mistake. Listen to "Eve of Destruction" Dont refuse. Listen. Make America Great Again. This Christmas restart the bomb shelter conversation. Remember Trump said he is a First Strike kind of guy. Teach you kids and grandkids how you used to leave class and go into the hallway and cover up when you heard the civil defense sirens. Teach the how to find you when the cell phones go dead. And only 6 weeks after the election - Trump and Putin are already talking a nuclear arms race. Trump thinks we have the nuclear advantage, a first strike is right around the corner. 19 days. The first act of the Trump presidency may well be a nuclear war. WORLDPEACE – ISRAEL – Trump - JESUS: The UN Security Council today finally was able to act against Israel’s international illegal building of settlements on occupied Palestinian territory. After 5 decades of U S Presidents sheltering their bad boy Israel, Obama said enough. Trump tried to play a hand in a game that he does not understand and failed. And like always he threatened the UN. He threatened all the countries in the world. Funny. Crazy. The writing is on the wall. It is just a matter of time before the Zionist are pushed off the Palestinian land. It is set in stone now that anything outside the 1967 boundaries are going to in time go the Palestinians. This means that the old City of Jerusalem, which is in East Jerusalem is going to be in control of the Palestinians. It means the Dome of the Rock on the Temple Mount will remain in place and Israel will never build a Third Temple. It means all the Christian Book of Revelation is going to be ignored as does almost all prophecy. You see Jesus said “ask and receive, seek and find, knock and enter” and “if you have the faith of a mustard seed you can move mountains” and “anything you ask in my name, I will do it,” and “Lo I am with you always,” All of which means that the Book of Revelation 1900 years ago does not apply to the will of the majority of the secular law of the world human society presently in existence. A new dream vision is being scripted. 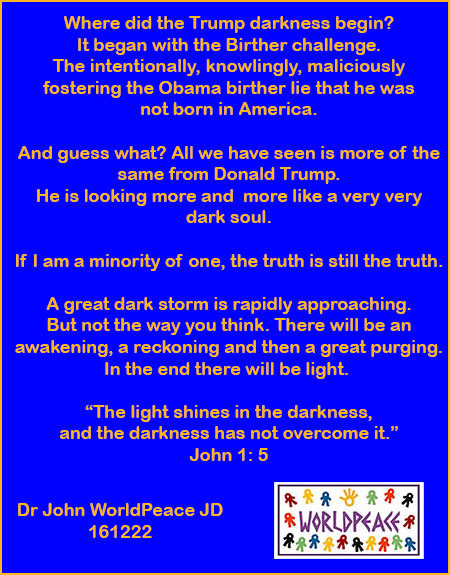 The Book of Revelation and its doom and gloom is being replaced by a dream vision of a more sane and just world human society. 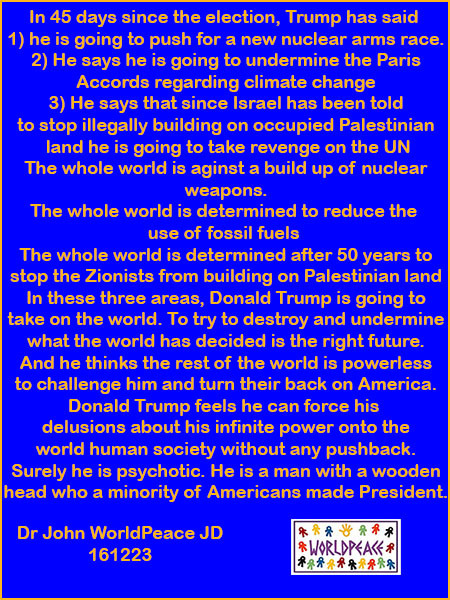 WORLDPEACE – TRUMP – JERUSALEM USA EMBASSY: Quote from the article: Donald Trump's pledge to move the U.S. Embassy from Tel Aviv to Jerusalem poses monumental challenges in one of the world's most tense environments, according to experts. Relocating the diplomatic outpost to the holy city is "a very big priority" for the president-elect, aide Kellyanne Conway told radio host Hugh Hewitt earlier this week. David Friedman, Trump's pick for ambassador to Israel, reinforced this commitment Thursday, saying he looks forward to serving "from the U.S. Embassy in Israel's eternal capital, Jerusalem." 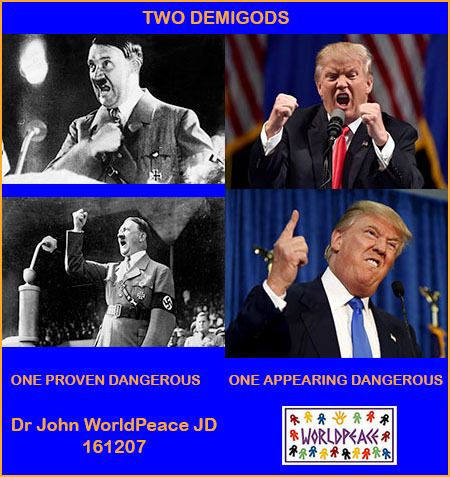 WORLDPEACE – TRUMP – TRAITOR? : For those who were around when Watergate was unfolding it sure looked like what is happening with the Trump Putin collusion to influence the election. Lots of little pieces that come together slowly but steadily. For me it looks like the minority of Americans who voted, elected a traitor. This Putin issue is growing legs as they say and not much looks good for Trump. His big mouth about asking Russia to hack Clinton emails. Why would he say that? Why would he continue to tout Putin as a good guy. Why would he have and place so many Russian friends in his administration? 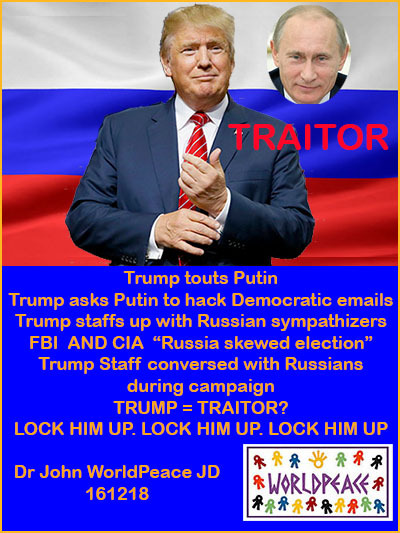 You know what they say, “if it walks like a duck and quacks like a duck, it’s a duck.” If you tweet like a traitor and act like a traitor, then you are a traitor.” LOCK HIM UP. LOCK HIM UP. LOCK HIM UP. 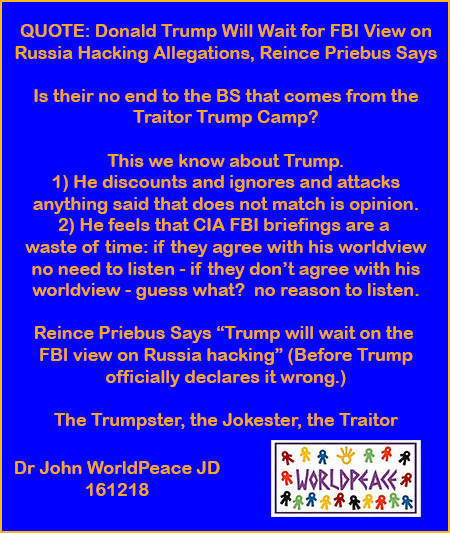 WORLDPEACE – TRUMP – TRANSPARENCY OF MANIPULATION: QUOTE: "Donald Trump Will Wait for FBI View on_Russia Hacking Allegations, Reince Priebus Says" Is their no end to the BS that comes from the Traitor Trump Camp? 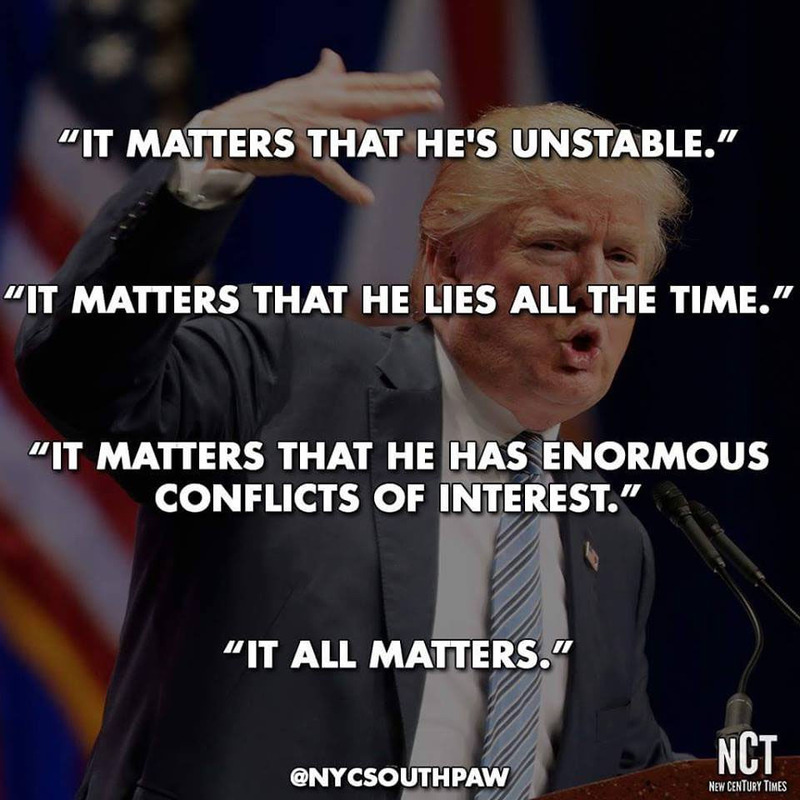 This we know about Trump. 1) He discounts and ignores and attacks anything said that does not match is opinion. 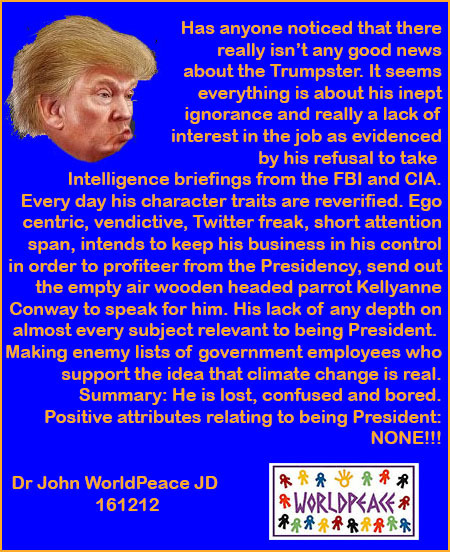 2) He feels that CIA FBI briefings are a waste of time: if they agree with his worldview no need to listen - if they don’t agree with his worldview - guess what? no reason to listen. Reince Priebus Says “Trump will wait on the FBI view on Russia hacking” (Before Trump officially declares it wrong.) 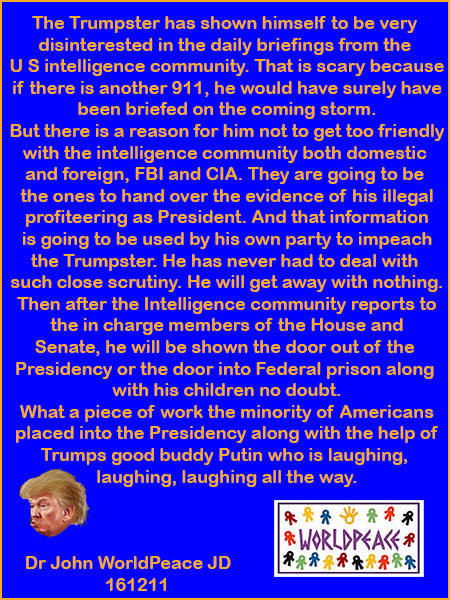 The Trumpster, the Jokester, the Traitor. 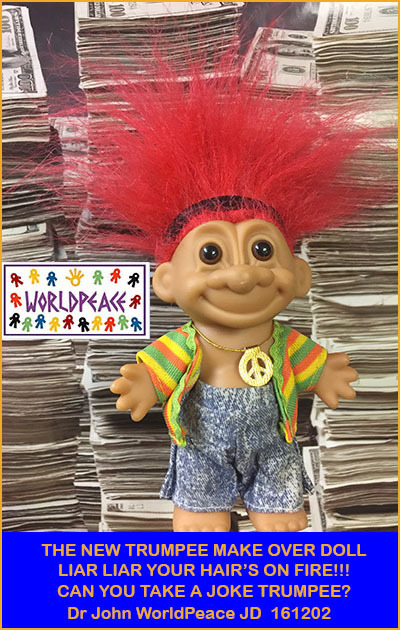 WORLDPEACE – TRUMP – RUSSIAN MANIPULATION OF AMERICAN PRESIDENTIAL ELECTION: The Russian manipulation of the Presidential election has been presented by the CIA and not promoted but not denied by the FBI. The CIA is to gather information and draw conclusions. The FBI is more limited in that they only present information they feel they can win in court. So the fact that the FBI is more conservative on this issue does not mean they are not looking at a smoking gun. The question is can they prove it. The problem here is the Electoral College. Will they put Hillary into the Presidency or will they stay with Trump and as these congressional investigations show that the Russians did manipulate the election, then what is to be done with Trump as President. Impeach him because he is basically an unAmerican Russian agent? How could he not be removed from office. How can he function as president with this kind of cloud hanging over him for four years. How can he not be looked as supporting a Russian global agenda? And how could he not know based on all his Russia leanings that Russia was going to attempt to put him into office. And another collateral issue, if Julian Assange did knowing aid and abet the Russians in their effort to manipulate the presidential election he must be brought to justice in America which must give him a life sentence in Federal Prison. The Russian hacked the RNC as well but none of that information was put out for public consumption. FBI Director Comey should also be thoroughly investigated as a Russian operative. How could he not be. These matters are already at the crisis stage and must be immediately dealt with; as in right now. The first step is to declassify the CIA and FBI information regarding the Russian manipulation investigation. Quote from the article (Trump and his aides have pushed back against reports of any Russian interference in last month's election, and the president-elect himself cast doubt on the accuracy of the CIA's intelligence. But GOP congressional leaders are supporting an investigation into whether Russia did interfere. Senate Majority Leader Mitch McConnell, R-Ky., said he has the "highest confidence" in U.S. intelligence agencies. House Speaker Paul Ryan, R-Wis., also said in a statement that Congress "must condemn and push back forcefully against any state-sponsored cyberattacks on our democratic process." Democratic congressional leaders have been far more direct in their criticism and accusations. Retiring Senate Minority Leader Harry Reid, D-Nev., blamed FBI Director James Comey's letter in the final weeks of the campaign for reigniting controversy around Clinton's private email server and costing her the election. And yet, Reid noted, Comey did not release more information about possible Russian involvement in the election. 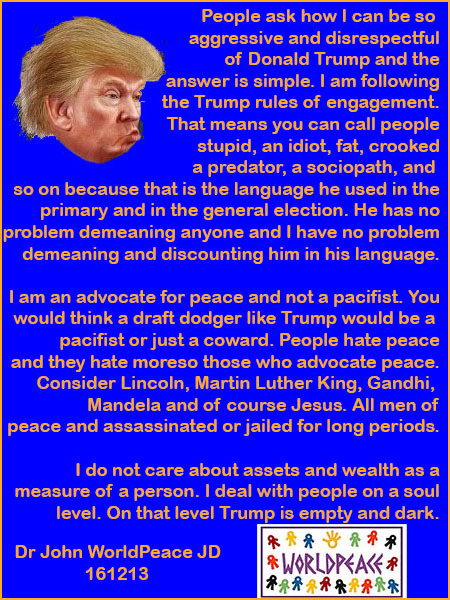 WORLPEACE – TRUMP – THE GHOST OF NIXON: As each day goes by we see the same unstable, mentally ill Trumpster, repeat the same behavior. He lies. 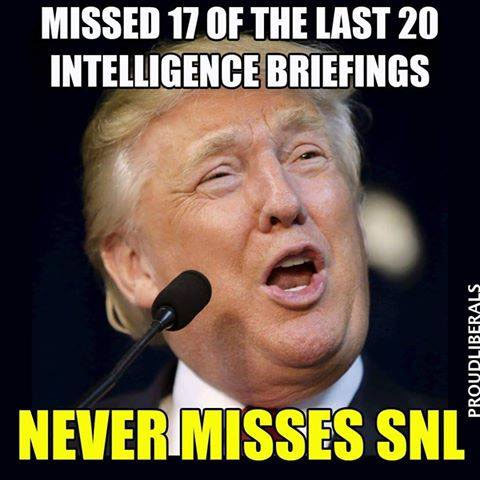 He ignores anything and everything his limited intelligence and lack of political experience cannot compute. He attacks. He attacks. He attacks. He denies reality that the US Intelligence community knows the truth and knows more than he does. 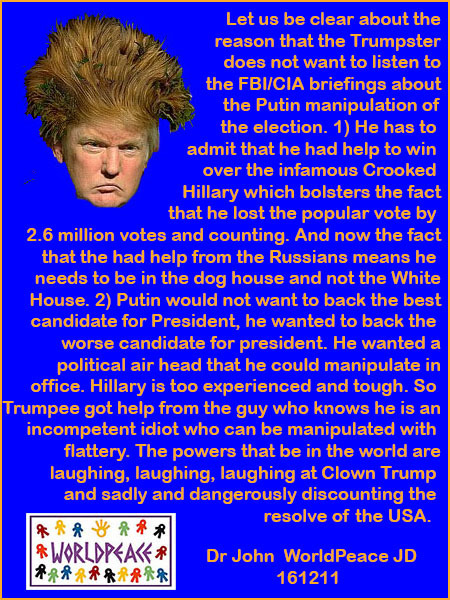 He thinks Putin is a good guy because Putin it seems helped destroy Hillary not because Putin likes Trump but because Putin’s evaluation is that Russia will gain more of its agenda easier with an inept clown like Trump at the helm of America. In other words, Trump cannot connect the dots that Putin thinks the Trumpster is laughable. Putin has an agenda, he is very politically attuned, he is daring and bold in a world of passive nations. Quote from the article: (If Trump’s programs fail to deliver … results, then a very dark scenario looms. WHAT MIGHT SAVE US? IF TRUMP'S ANOTHER NIXON? By THE ASSOCIATED PRESSDEC. 11, 2016, 1:27 P.M. E.S.T. CHRIS WALLACE CONFRONTS TRUMP ON CONFLICTS OF INTEREST: "YOU HAMMERED HILLARY CLINTON..."
WORLDPEACE – TRUMP – FASCIST TRUMP PREPARING ATTACK ON GOVERNMENT BUREAUCRAT OVER CLIMATE CHANGE. Now we have the President-Elect of the United States micro-managing those who work on climate change. Presidents work through Department Heads. Asking for a list of pro climate change government employees shows just how vicious Fuhrer Trump is. Make American Great Again, what a sick vicious predatory joke. The Trumpster is an alt-right Fascist ready to employ whatever Nazi abuses he can get away with. 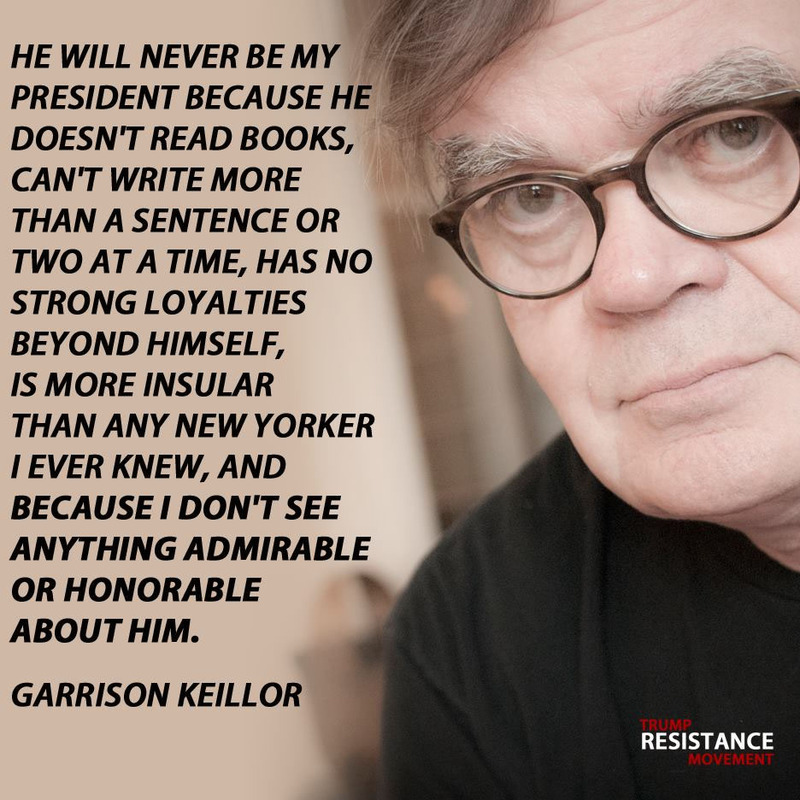 The Trumpster is a very dangerous unAmerican. And all those who voted for him have to take ownership of his fascist actions and programs and his attack on America’s core values. DUMP TRUMP: IMPEACH HIM NOW. (Quote: President-elect Donald Trump's Energy Department transition team sent the agency a memo this week asking for the names of people who have worked on climate change and the professional society memberships of lab workers, alarming employees and advisors. TRUMP TEAM MEMO ON CLIMATE CHANGE ALARMS ENERGY DEPARTMENT STAFF. ‘We’re going to throw everything at him that he threw at us,’ said one longtime Democratic operative. 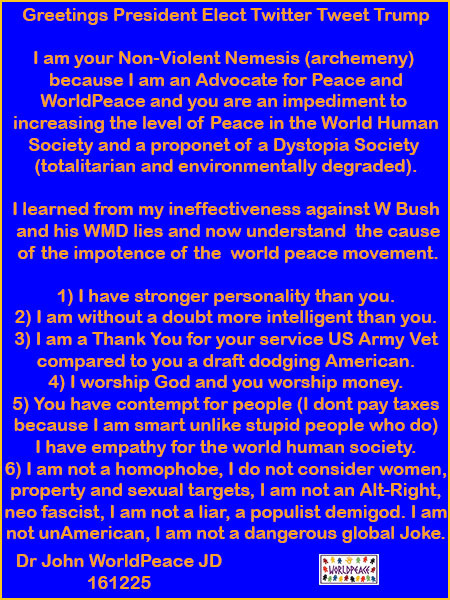 WORLDPEACE – DEMOCRACY – TRUMP: Christopher Suprun, a Republican Presidential Elector, tells his story below. He will not vote for Donald Trump. His reasons are all valid, but it is not really necessary to get to those reasons. 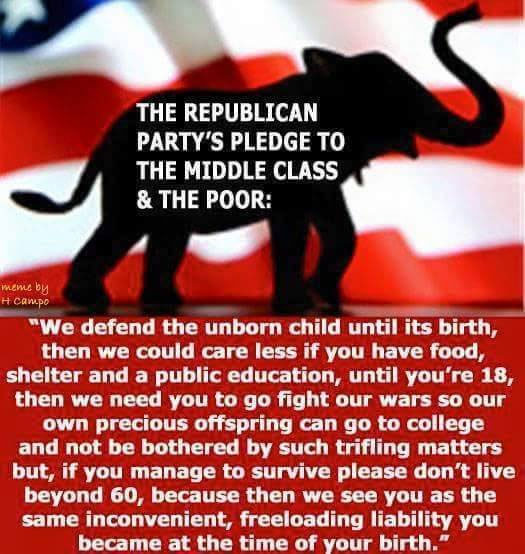 There is a patriotic reason that is even more fundamental. The Electoral College is a corruption of the American Foundational Principle of One Person, One Vote. 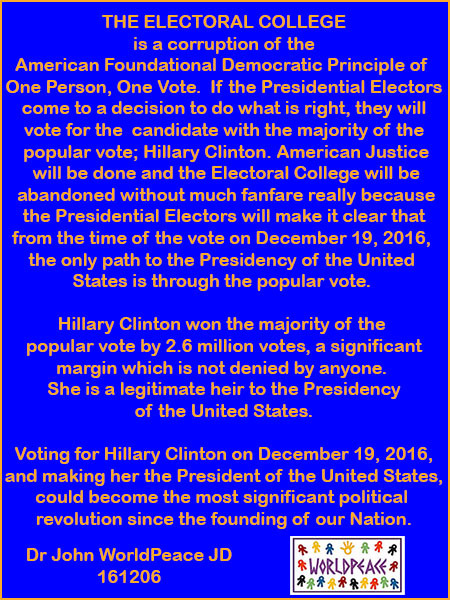 If the Presidential Electors come to a decision to do what is right, they will vote for the candidate with the majority of the popular vote; Hillary Clinton. 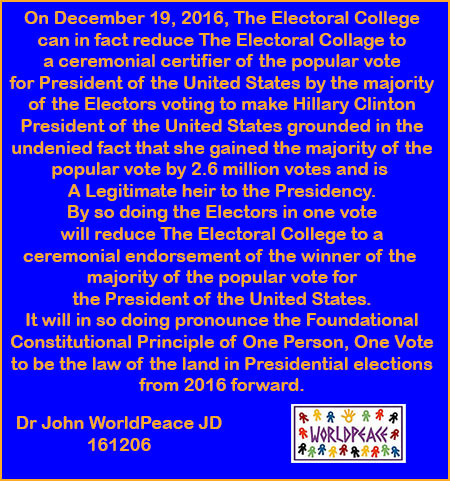 American Justice will be done and the Electoral College will be abandoned without much fanfare really because the Presidential Electors will make it clear that from the time of the vote on December 19, 2016, the only path to the Presidency of the United States is in the popular vote. No one will trust the Electoral College again. And that is as it should be. No one can argue that the will of the people was not done. One Person, One Vote, the majority wins. 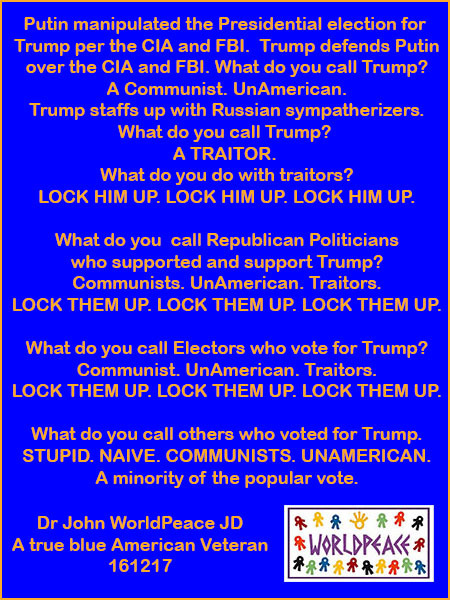 If the electors do not choose this path then we will have to live with an unAmerican President and we will enter the next Presidential election with a flawed vote process for electing the President of the United States. IRAN – NUCLEAR ARMS – AND THE RUSSIAN, IRAN, SYRIA TRIAD – Russia has stepped into the vacuum in the Middle East where the UN and the United States should have created a very high wall against such an event but Obama was a little too afraid of confrontation. The Russians came in under the auspices of getting rid of ISIS when all it did was bomb all the trouble makers in Aleppo who have been the brutal target of Assad and his father to wipe out this bastion of rebellion. Now Russia is prepared to bomb Aleppo into dust and have no doubt that most of those who lived in the city are going to be imprisoned and then slowly executed so as not to draw too much attention. Russia is a forceful and seemingly fearless problem under Putin. He took the Crimea without a shot being fired as NATO did nothing. Now he has moved into Syria and it seems Syria is lost. The Russians are too dug in. Bottom line is that the US in ratcheting up sanctions against IRAN has got to be careful how its new Russian buddy might react. TRUMP SPENDING HIS BIG BUCKS TO STOP JILL STEIN’S LEGAL RIGHT TO A RECOUNT. MORE TRUMP HABIT OF SUING OTHERS UNTIL THEY ARE BROKE OR KISS HIS ? Feet? This is very interesting how Trump is carrying forward into the White House his right to sue anyone to oblivion. Money is Right. The Power of Money accumulated to be used on frivolous lawsuits. I wonder if he is going to sue the heads of state that challenge him. But you see Trumpee has a near sighted problem. You see all his blowing and suing is really going to be questioned if the vote was rigged as he so often says. How is he going to respond to questions about how he really knew the vote was rigged. And then there is the other side of the coin, showing a fair vote means his ranting about 3 million illegal votes in California is wrong and he just simply has no mandate from the people. He is more rejected than Hillary. I say we have not had a serious challenge to electronic voting. Lets get it done and test the system. Thanks Jill. DONALD TRUMP'S ATTORNY GENERAL JEFF SESSIONS FOUGHT TO DERAIL GAY RIGHTS CONFERENCE. TRUMPS ACHILLES HEEL – TOO MUCH MONEY – BYE BYE TRUMPEE: It seems the Trumpster is getting the message, because he is responding to it, that anything short of divestiture of his empire is going to put him in the crosshairs of the government and the press. Everything the Trump does though his children or himself with regards to business in America and much more so in foreign countries is going to be examined in detail. 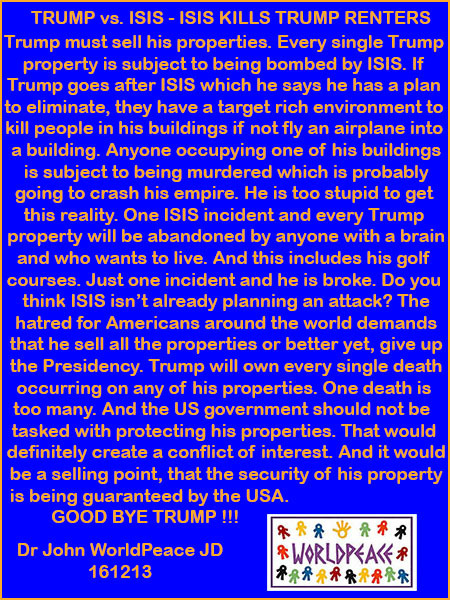 Trump cannot open anymore golf courses or sell his name to any more big buildings in the world without the press being there and tracking the deal in detail. Every media reporter on the planet wants to be the one to take down the Trump. His big mouth has made a lot of enemies in the media and that media knows this is where they can end the Trumpster. And then along will comes the government. QUOTE FROM ARTICLE: “The Office of Government Ethics has informed lawyers for President-elect Donald J. Trump that only a divestiture of his financial stake in his sprawling real estate business will resolve ethical concerns about conflicts of interest as he assumes the office of the presidency.” The Trump has his notice. This is a classic Nixon vs. Press battle over Watergate. NIXON LOST. Trump will lose. 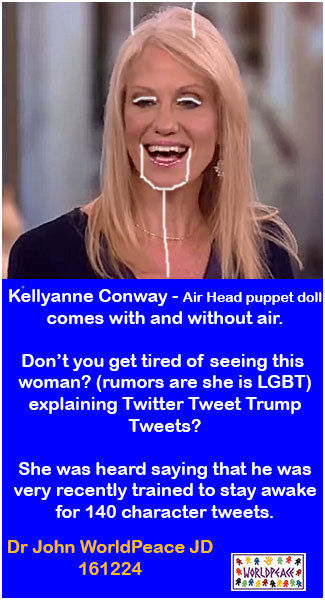 QUOTE FROM THE ARTICLE “The revelation from the normally secretive federal agency came Wednesday in a bizarre series of oddly informal postings on its Twitter account after officials apparently concluded, erroneously, that Mr. Trump had committed on his own Twitter account to divesting his assets.” My concerns to date on this issue was that somehow the Trumpster was going to be able to back down the government and throttle back the press. Looks like he will not be able to do that. AND IF TRUMP DETERMINES HE MUST DIVEST FROM HIS BUSINESS, HE WILL ABANDON THE PRESIDENCY. Before or the day after inaugeration. The killer here is that if Trump tries to run his business -he is going to sentence his children to jail. TRUMP CALLS FOR REVOKING FLAG BURNERS' CITIZENSHIP. COURT RULING FORBID IT. WORLDPEACE: THE ISRAELI ZIONIST PEACE JOKE: We need to keep the Palestinian issue unresolved because it shows just how gutless and weak and corrupt the United Nations is on this issue. The refugee camps. The fascist apartheid State of Israel is everything the United Nations is supposed to prevent. Every human being per the UN is entitled to a country, a citizenship. Yet Palestinians have been denied this since the Zionist declared themselves a Nation. No one can make the Zionist do anything. 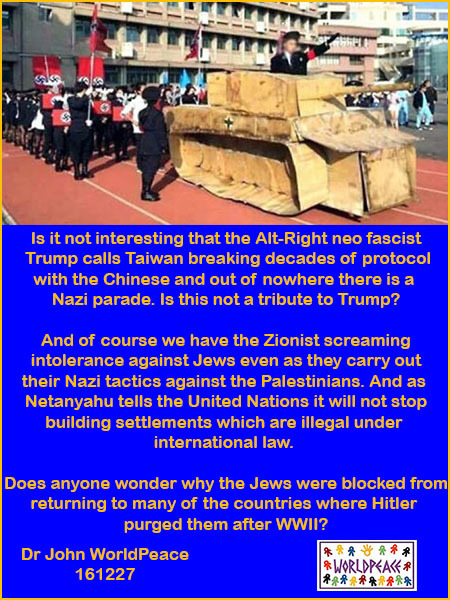 No one has any solutions and the Zionist just sit back and make excuses and talk like Donald Trump and his Alt-Righters. And every couple of years the Zionists make an illegal assault on the Temple Mount and terrorism breaks out in Israel and the Zionist blame the Palestinians. God gave the Temple Mount to the Muslims. Who is going to deny that? If Israel tries to take it, there will be a global Muslim Jihad like no crusade before. So look for Israel to grab all it can and look for them to be denied the heart of their Theocracy, the Temple Mount. And all those who buy products made by Zionist on Palestinian land are contributors to the problem. I am a friend of all Jews and an antithesis to all Zionist based on the current reality of the Palestinians. If I am a minority of one, the truth is still the truth. Dr John WorldPeace JD 161129 www.johnworldpeace.com www.impeachpresidenttrumpusa.com Friend me on Facebook. THE TRUMPSTER THE CHAOTIC ONE: "The early morning blast was classic Trump, picking at an emotive political scar that enlivens his most loyal supporters, hijacking news coverage and forcing everyone in Washington to respond to his own controversial views -- and then wonder if he really means it. It's a tactic familiar from the presidential campaign when Trump's mastery at wielding Twitter as a weapon was at the heart of his battle plan that demolished the Bush and Clinton political dynasties." 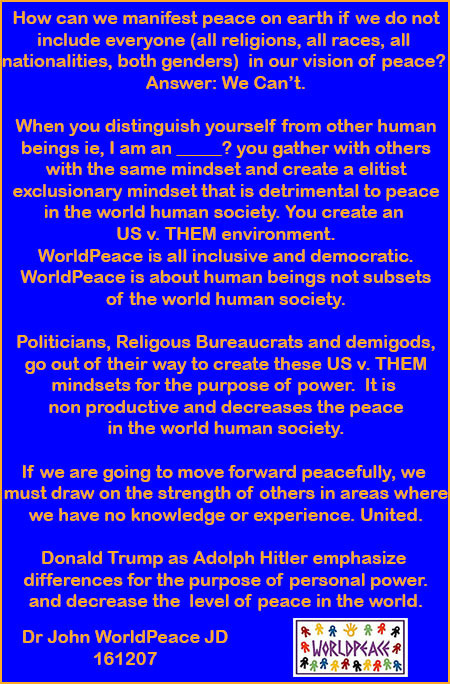 WORLDPEACE: PEACE BETWEEN NATIONS: Donald Trump seems to want to turn America into an isolated country to the detriment of the United States and to the rest of the world in that America is the shining light in the world human society, the world of nations, in that in America there is a secular government, no riots and religious, racial, national, gender factions in constant battle with each other. The Trump has gone out of his way to bring chaos to America by enabling the Alt-Righters to resurrect the hatred of Hitler and the Confederacy and focus the population on all Muslims for instance as being inherently evil. Basically, a White is right agenda. America first, as opposed to a leader of the world into globalism and greater economic entanglement that will make war very difficult without destroying economic customers and vendors. Trying to isolate Cuba will have similar effects that exist in North Korea. No country that is exposed to Capitalism cannot help but be positively infected with it for the betterment of its people and the increasing of the level of peace in the world. The Trump wants to create tensions with Cuba when there is a clear road to normalization between the United States and Cuba. The core issue is the fact that Cuba beat back America. Castro won. And that for most Americans is a dark history the same way that anyone who challenges the Trumpster is going to be attacked. Lets open up Cuba and keep the Trumpster focused on areas of problems in the world like Iraq, Syria, Afghanistan. Cuba is a huge economic mecca for American capitalism. It cannot happen fast enough. 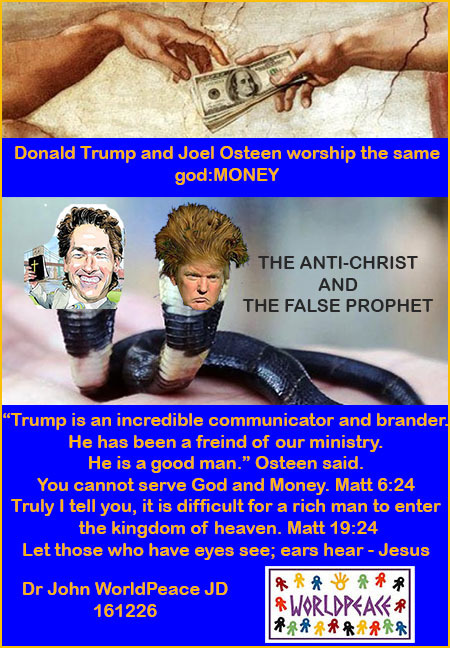 The greed oriented Trumpster is about making money. So why is he pushing this virgin territory away? Just another example that he is just a puppet to unknown forces. Dr John WorldPeace JD 161129 www.johnworldpeace.com www.impeachpresidenttrumpusa.com Friend me on Facebook. BY tracy Wilkinson NOV. 28, 2016, 11:16 A.M.
WORLDPEACE: GLOBAL WARMING: The Great Barrier Reef is under attack by warming waters and polluted waters. Is the world going to lose something of value, that being a beautiful blue marble we live on as opposed to a sterile desert. What is the value of species on their way to extinction? The loss of song birds. The loss of insects singing in the night. The loss of breath taking beauty all over the planet. Does this beauty have no value when compared to a demand to burn fossil fuels until we live in a smog ridden sterile desert planet. The Trumpster says beauty does not matter when compared to money in the bank. The only beauty the Trumpster recognizes is Gold. People dying around the world from diseases, famine, wars are a distant second to his Golden God. 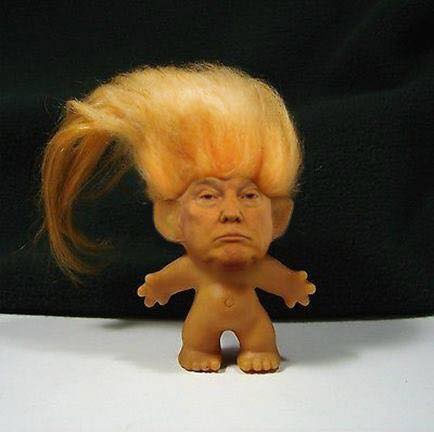 The Trumpster is a one trick pony – Gold Rules. The Power of Gold is everything. Dr John WorldPeace JD 161129 www.johnworldpeace.com www.impeachpresidentTrumpusa.com Friend me on Facebook. GEN. JAMES MATTIS, CONTENDER FOR TRUMP'S DEFENSE SECRETARY, SAID SETTLEMENT IN ISRAEL COULD LEAD TO "APARTHEID"
Without putting forth any evidence, the president-elect says he actually won the popular vote. TRUMP unAMERICAN: “I understand the impulse to give your successor room to govern, but we're not talking about policy changes. We're talking about fundamental changes to the republic,” said Hari Sevugan, who served as a spokesman for Obama’s 2008 presidential campaign and for the Democratic National Committee. Whether Obama decides to attack and confront Donald Trump over his unAmerican actions and rhetoric, rest assured I will not stop. 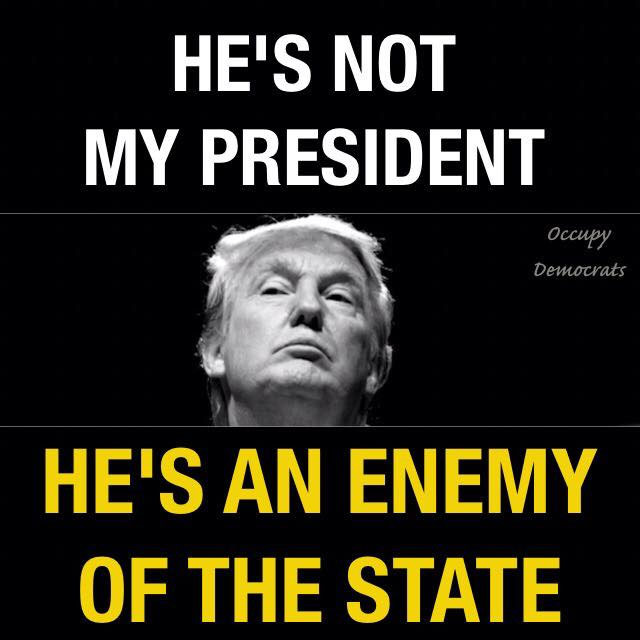 Donald Trump is a threat to America. I think there is not more push back because people are in shock at how unstable and crazy? he really is. 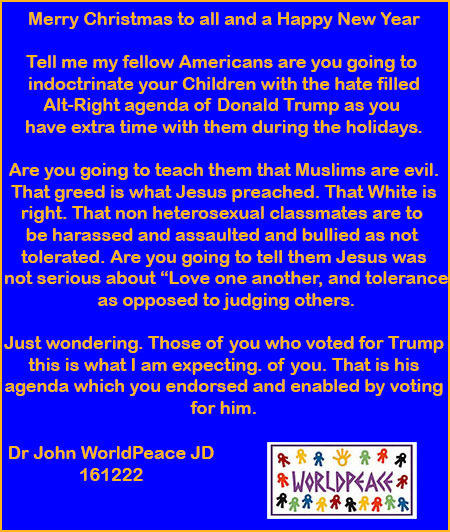 Dr John WorldPeace JD www.impeachpresidenttrumpusa.com www.johnworldpeace.com Friend me on Facebook. WORLDPEACE: CLIMATE CHANGE: This article has many reasons why climate change is a critical issue facing the world human society. The subordinating of climate change to purely profiteering which is an impediment to peace and WorldPeace is what The Trumpster is all about. We only have one planet to live on. We are killing millions with pollution. We can sterilize the planet of plants and animals. We can flood our coasts. We can harm the ocean and the creatures that live in it. The time for fossil fuels as a viable energy source is over. 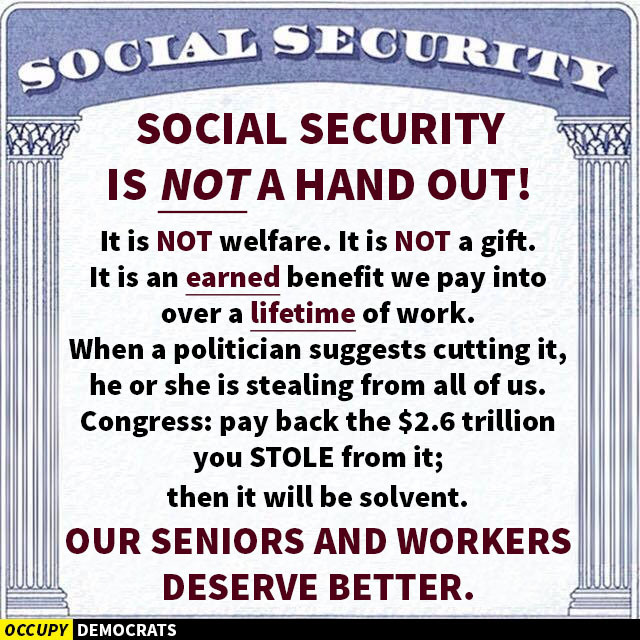 We need to grandfather it out of the energy options available to a sane world human society. 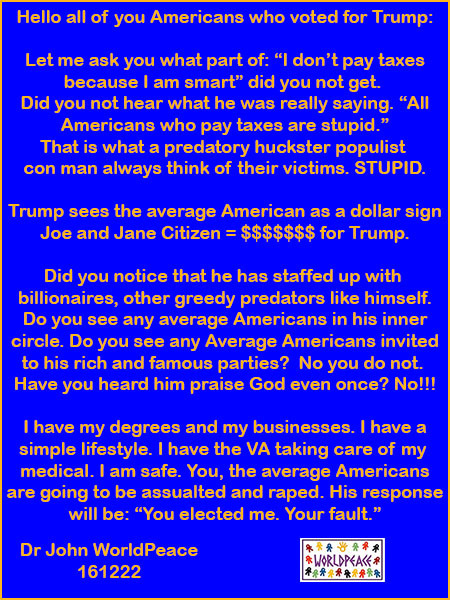 All Trump cares about is money and lining his pockets as an unAmerican profiteer as President of the United States. His business is more important than what is right and what is American core values much less increasing the peace in the world human society. IMPEACH TRUMP. Dr John WorldPeace JD 161128 www.johnworldpeace.com www.ImpeachPresidentTrumpUSA.com Friend me on Facebook. 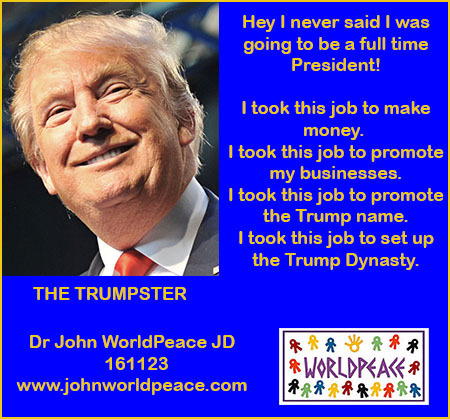 So it seems that The Trumpster is going to continue to run his business empire while President. He says he can do both jobs. But every President before him found it hard to find the time to just be President. While the Trumpster is doing business in the back halls of the Capital, decisions about health care, the economy, foreign relations, defense, etc are going to go unattended. So did you who voted for The Trumpster really vote for America's first part time President? There is no way that Donald Trump can be isolated from his empire in order to become an unbiased free standing President of the USA. 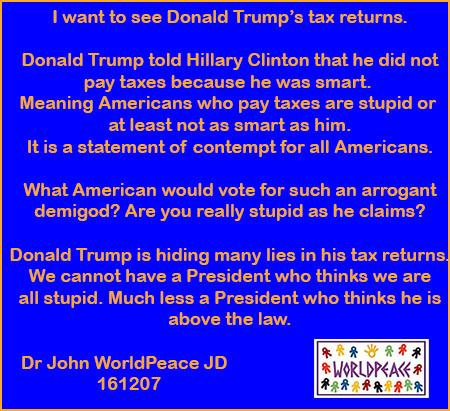 He refused to show his tax returns during the campaign. The reason is simple. If he was open about his worldwide investments they would come under attack by the press that would show the infinite conflicts of interests between the Trump Empire and the policies of the USA. Every year the President must publish his tax returns. But this will cause an endless degree of scrutiny. Which Trump has to date refused to submit to. This one article is just a tiny summary of all the conflicts of interest. I said during the campaign that Trump was going to have to give up his empire or give up the Presidency. 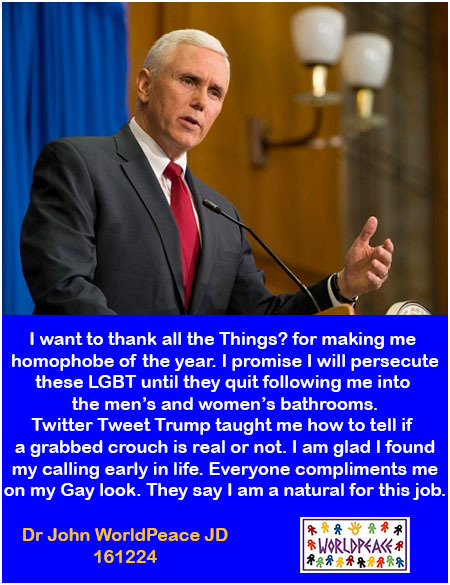 If he resigns, Pence becomes President. A horrible scenario. Trump must go. The opportunity to become 100 times richer than the richest man on the planet is obvious. Electing Donald Trump was a mistake. It is just now becoming obvious how great a mistake. 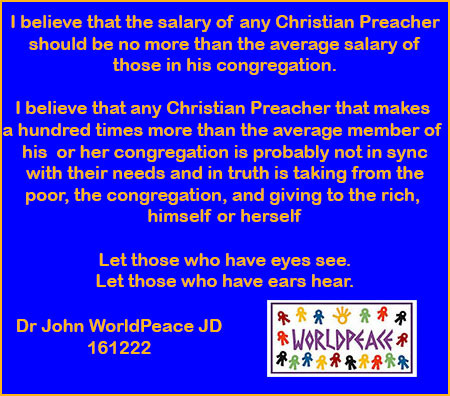 Dr. John WorldPeace JD 161121 Friend Me www.johnworldpeace.com Rally round the WordPeace Advocacy. Impeach Trump. Already, the family has shown how porous the wall between his business and diplomacy could be. Trump on Thursday welcomed Japan’s prime minister, Shinzo Abe, to his New York penthouse, his first face-to-face with a foreign head of state as president-elect. Joining them was a member of Trump’s transition team and an executive vice president of his business empire: his daughter Ivanka. GLOBAL WARMING: The scientists do not understand what is happening with the ice at the polar caps. This is not good. We only have one planet to live on. No escaping to the moon or to Mars. We may be on a trajectory toward a tipping point with regards to global warming in which we will have no ability to reverse. Death due to starvation, disease, Wars. Basically all the Armageddon scenarios. 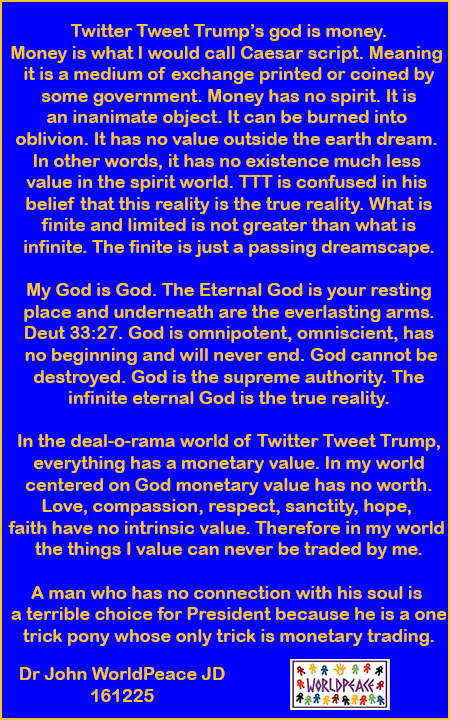 Arrogant Demigods like Donald Trump are sending out a message that he has God knowledge that we can warm the earth as much as we want with no consequences. He is gambling with the lives of your children and grandchildren. The whole world agreed in Paris that global warming is a problem and Demigod Trump is telling everyone they are foolish except him. Well when the worst effects of global warming begins, will you pray to God for you apathy or pray to Donald Trump to save you and your children from the apocalypse he helped foster. 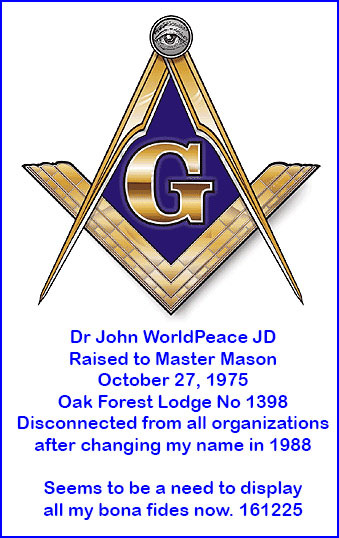 Dr John WorldPeace JD 161121 Friend me on Facebook. www.johnworldpeace.com www.thebookofworldpeace.com ‘Things are getting weird in the polar regions’By Chris Mooney November 21 at 8:31 AM The Washington Post. Let me say up front I have Jewish friends but I don’t think I have any Zionist friends any more than I have serious alt-right friends. There are Palestinians refugees in the neighboring countries and those in the territories. 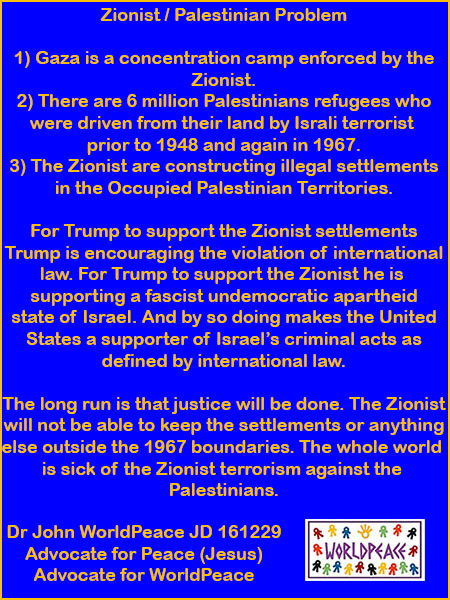 I think there must be a Two State solution and the Zionist are kidding themselves if they think they can kept the Palestinians in the territories and refugee camps without citizenship under the UN Charter in the long run. They can build all the settlements they want but in the end the Palestinians will have their nation. If that becomes obviously wrong, then ISIS has a natural made to order recruiting territory. But more importantly, and critically, there is no way as in NO WAY that the Zionist are going to take ownership of the Temple Mount. So Israel can never achieve what it wants, the old Israel of Jesus time much less the time of Solomon and David. And there is the Christian issue. Jews don’t believe in Jesus. 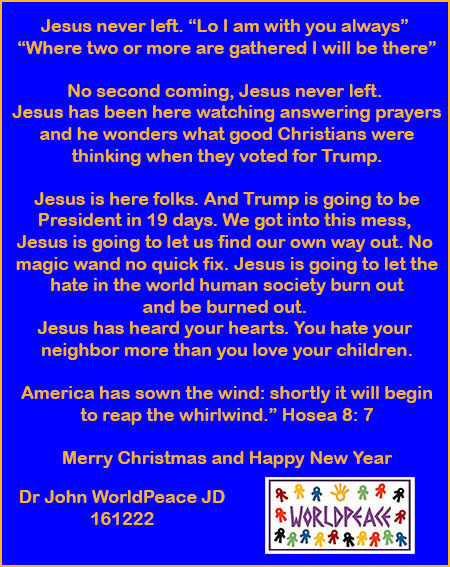 And there is a huge under current among Fundamental Christians, worldwide, bigger that Trump’s White is right coalition, that believe that all not Christians are doomed to hell. Christians give lip service to the Jews but if things get really tense and openly combative, they are going to fall in line against Jews and Muslims both. Netanyahu and the other Zionist are discounting this overwhelming blow back if the Zionist get too ambitious. Christians are not going to allow Jews to make sacrifices on the Temple Mount as part of a theocracy like Iran. So for now this issue is just slow cooking. Anybody that thinks they know Donald Trump is delusional. 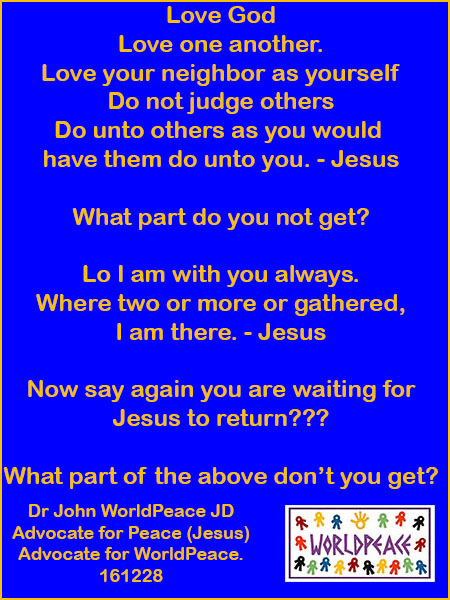 Dr John WorldPeace JD 161116 www.johnworldpeace.com Friend Me. Yelp the US is losing Asia to China. The Philippines have gone over. Now Malaysia moving. The real world is about Globalism and free trade. Trump and England are about isolationism. We cannot lead what we are not involved in. Make America Great. NO. Make America irrelevant in Asia. YES. China with a more progressive plan for Asia will push out the USA. Just like the Japs were doing before WWII. But peacefully. All those nations need a big Brother. Trump says not the USA without big money. They say. CHINA then. We have to negotiate things. We dont have the ability to dictate in the 21st century. England is headed for irrelevance in the world. Donald Trump has taken the first steps to make the USA irrelevant in ASIA. 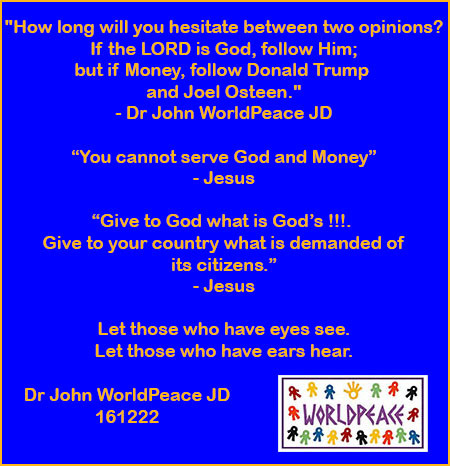 Dr John WorldPeace JD 161115 www.johnworldpeace.com. Friend Me.